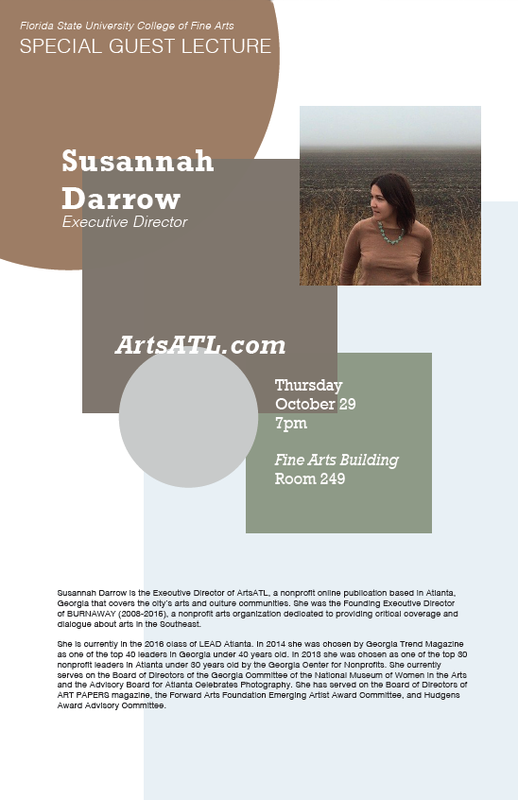 Susannah Darrow is the Executive Director of ArtsATL, a nonprofit online publication based in Atlanta, Georgia that covers the city’s arts and culture communities. She was the Founding Executive Director of BURNAWAY (2008-2015), a nonprofit arts organization dedicated to providing critical coverage and dialogue about arts in the Southeast. She is currently in the 2016 class of LEAD Atlanta. In 2014 she was chosen by Georgia Trend Magazine as one of the top 40 leaders in Georgia under 40 years old. In 2013 she was chosen as one of the top 30 nonprofit leaders in Atlanta under 30 years old by the Georgia Center for Nonprofits. She currently serves on the Board of Directors of the Georgia Committee of the National Museum of Women in the Arts and the Advisory Board for Atlanta Celebrates Photography. She has served on the Board of Directors of ART PAPERS magazine, the Forward Arts Foundation Emerging Artist Award Committee, and Hudgens Award Advisory Committee.